I think it’s the Best Month! I love the month of November, and in fact it’s probably one of my favorite months of the year. First of all, it begins all the holiday celebration and the atmosphere of the world (to me) changes and things begin to just get more exciting, at least in and for my family. Also, it’s my birthday month, as well as my best girlfriend’s, Kim Fazzino, who lives in Houston, Texas (shout out to her, love and miss you! ), and since we are one day apart, we usually get to go on some kind of trip together around that time to celebrate. So now that I have passed the 40 year mark (yes, it’s true – sad, but true) I have made a rule that I get to celebrate for as long and as often as I like and the calories that are eaten for the sake of celebrating for one’s said birthday, do not in any way count towards adding poundage to one’s body (that’s totally my rule). 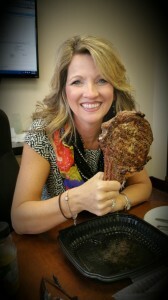 That is where this huge cowboy steak comes in (Compliments of Sullivan’s Steakhouse in Naperville)… my good friend and business partner, Todd, brought in an entire birthday lunch to one of our team meetings, which included the steak, au gratin potatoes, calamari, shrimp, salad, apple pie and ice cream! We at the Dena Furlow Team do enjoy our food and do not pass up a good reason to indulge in a good meal! 🙂 Please forgive me if you are one of my vegetarian friends – I mean no disrespect! Fall – One of my favorite times of year!